Leg to rail construction is a very common part of building furniture. There are lots of ways the joints can be created, but few are as quick and easy as pocket holes. And, there’s plenty of strength in a pocket hole joint. It’s common for a leg to rail joint to have a reveal, an offset, between the face of the rail and the face of the leg. 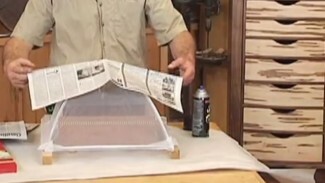 In this video we’ll show you a dirt simple way to build an offset into your furniture projects. 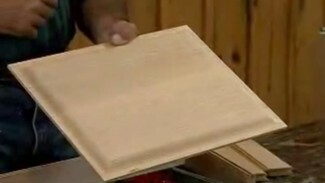 If you’re making furniture, you’re probably also making things like table tops. For these, you need edge to edge glue ups. Not enough clamps to do the glue ups you need to create? No problem. Pocket holes to the rescue again. Put pocket holes along the edges that you’re putting together, and you can use pocket hole screws to draw your edge to edge joints closed. When you’re building cabinets and have a blind end, one that goes against a wall or another cabinet, pocket holes will help you save on clamp use again. You can cut pocket holes in the case side at the front edge, and use pocket hole screws to pull the face frame against the front of the case. This approach frees up clamps, and also means you can keep working with the case without having clamps in the way. 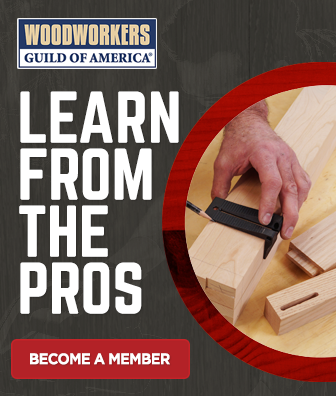 There are lots of ways to join wood in addition to pocket hole joinery, so check out more videos on joints and joinery. And, if you want to mask your pocket hole joinery, there are also techniques for hiding screw pockets. For further details on the Castle 100 Pocket Hole Machine visit www.castleusa.com. You used two kinds of glue, different woods? Hi Robert. Titebond’s Quick and Thick glue is a much better choice for end grain applications, like we’re seeing here between the rails and legs. Another great spot for it would be miter joints. Standard yellow glue is fine for the edge to edge glue up, where we don’t need the extra viscosity that Thick and Quick offers. Hi Chris. You could use table top fasteners if you want. In this case, the table top was narrow which meant that only a single fastener point was necessary at each end. When doing this in the middle of the table top, you do not need to account for expansion and contraction, as this can happen naturally without any restriction. But it is always a safe choice to use table top fasteners. You screwed the top of the stool to the rails on all four sides? 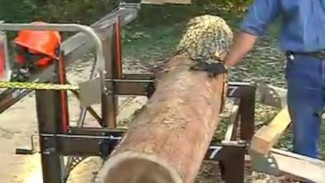 Does that eliminate the ability for the wood to sufficiently expand and contract? Hi Matt. Only the two ends with end grain were screwed using one screw in the center of each end which is possible because the stool is not very wide. This allows the top to expand and contract freely. I don’t have a pocket hole machine, but I use pocket holes lots. I use a pocket hole jig set purchased at lowes for about $30.00. It works great. This video has something that I have seen several times. George is demonstrating something on the work bench and a banner appears right on top of what we are looking. I know that the banner identifying George is important, but not right on top of the demonstration. Thanks for all the work that goes into the videos, managing this very fine site, and for reading my complaint. Thank you for your feedback. I will forward your comment on to the proper department. We appreciate your feedback. ticket 19320 In this video, George is using a Castle 100 pocket hole machine. I am considering the purchase of a more automated pocket hole jig. How would you compare this machine to the Kreg Foreman machine? If you are using the Castle 100 machine can you use Kreg pocket hole screws? You can use any pocket hole screws you like, regardless of what device you use to make the pocket holes. The Foreman is faster than the Castle machine, since it’s a one pass operation. With the Castle machine you do one motion to cut the pocket, and a second motion to create the hole for the shank of the screw. The Foreman does it all in one motion. The Castle machine can be carried to your work, if needed. So, if you had really big carcase pieces, you might want to take the tool to the work instead of the work to the tool. The Foreman is too big to allow that. Tool choice there will depend on the scope of work you plan on doing. I agree on the Foreman being to big to carry around, but I use a Kreg K4 for all my pocket holes. To be honest, I’m finding it very usefull, since I can create the pockethole with 1 drill action. But learned some new things from the video! Keep on the great work.